PEM 6446(A-1) - 68 SPRAY & DRAIN COMBINATION is designed as a heavy duty, vandal resistant spray and drain unit for flush installation into concave spray aprons in public areas such as school yards etc. The sprays are usually manual operated with city water going to waste, or if need be with a recirculation pump system, underground tank with public swimming pool filtration & sanitation. Spray aprons edging must be above surrounding ground level to prevent surface washins. 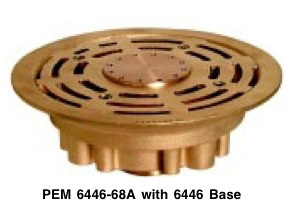 PEM 6446-68A with 6446 Base The spray & drain combination is installed into the center of a spray apron. 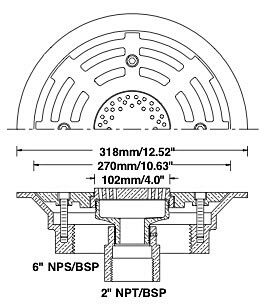 The riser pipe under the fixture is 6", terminating below frost level into a tee fitting , with a 3" or 4" drain connection into the side outlet of the 6" tee and a 2" through pipe connection coming up through the bottom of the tee. Connections are made with reducer bushings. For the 2" pipe, use 2" copper tube, ream out the stop within the 2" male pipe x copper adapter to permit the tube to pass through, then solder the joint. The internal height adjustment of the sprayhead permits tight fit into the fitting grate. It is advisable to pre-assemble the complete pipe & fixture combination prior to installation and connection to services. Nozzle orifices are as standard bored with the following outside drop pattern : 'A' Single nozzle ring (12) is at 6o off center. 'B' dual nozzle rings (24) are at 6o & 4o off center. 'C' triple nozzle rings (48) at 6o, 4o & 2o off center line. Other spray angles are custom made to order, maximum spray angle is 10o off center line. 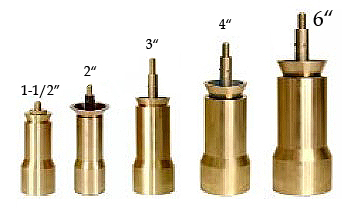 Standard orifices are 24 x 4.8mm/0.187", other orifices as listed below or as per PEM 800 Series orifice performances.